Mass A slides across a rough table with an initial velocity of 12 m/s in the +x-direction. By the time mass A collides with mass B (a stationary object with equal mass), mass A has slowed to 10 m/s. After the collision, the two objects stick together and move as one. Immediately after the collision, the velocity of the system is measured to be 5 m/s in the +x-direction, and the system eventually slides to a stop. Which of the following statements is true about this motion? Momentum is conserved during the collision, but it is not conserved during the motion before and after the collision. Momentum is not conserved at any time during this analysis. Momentum is conserved at all times during this analysis. 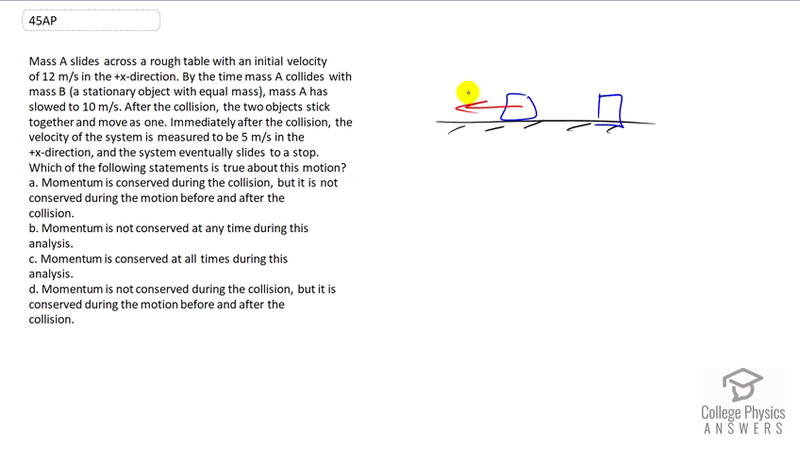 Momentum is not conserved during the collision, but it is conserved during the motion before and after the collision. This is College Physics Answers with Shaun Dychko. Momentum is conserved whenever there is no net external force acting on a system. But in this question there is a force acting on the system which is external to the system and that is the friction due to this rough table top. It's exerting a force like this and so this mass, mass A, is experiencing a net force on it. It's slowing down before it collides with this thing here. You can consider its momentum at this point here, it'll be something -- it'll be mass A times whatever velocity it has at that point, we'll call it x equals zero. Then just before it collides with his block here, its momentum has changed even before any collisions have occurred. So since that's the case, that means that momentum is not conserved because its momentum is changing. At these two positions, x equals zero and x equals whatever x two this is before the collision, this momentum has changed before the collision. So that's a clue that momentum is not conserved. The other clue is that there is a net external force acting on the system. Then after the collision it's the same issue where these two objects are being acted upon by the friction force. But during the collision, since they're not sliding during the collision and this is just the brief instant of contact between the two objects, during that moment there is no friction acting on it because it's not sliding; it's just kind of deforming and colliding. So during that instance, momentum is conserved. So we're going to give an answer A here.